Often people have trouble learning and understanding HTML because they don't have a concept of beauty and clean semantics. Spoiled by WYSIWYG “editors” (sic) and other newfangled nonsense I guess. 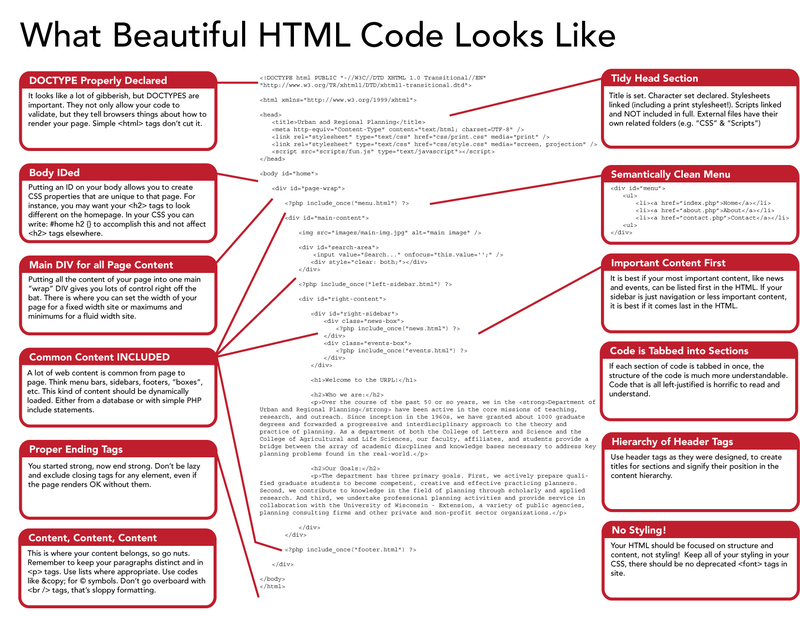 Chris Coyier to the rescue with “What Beautiful HTML Markup Looks Like”. Just look at it! Beautiful. If you use XHTML you also need to be aware of the issues regarding MIME types. On m.mongers.org I serve all XHTML pages as application/xhtml+xml for browsers that support it, and for the browsers that don't, I serve it as text/html, which is wrong, but tolerable. As usual it's Internet Explorer being way behind the curve here, even IE 7 doesn't get it right in spite of all the soothing standards compliance sounds they've been making about it in Redmond. I fix it by hardlinking all .html files to a corresponding .xhtml file—using just a single extra inode per file—and using Apache content negotiation to serve whatever the client claim to understand and prefer. It's a very lightweight way to do it, but there are plenty other ways, some discussed in the article linked above.